Not so fast, says a new generation of physicists: While the underlying physical laws haven't changed, new ways of "tricking" those laws to permit seemingly impossible actions have begun to appear. For example, work that began in 2007 proved that under special conditions, light could be made to move along a curved trajectory—a finding that is already beginning to find some practical applications. 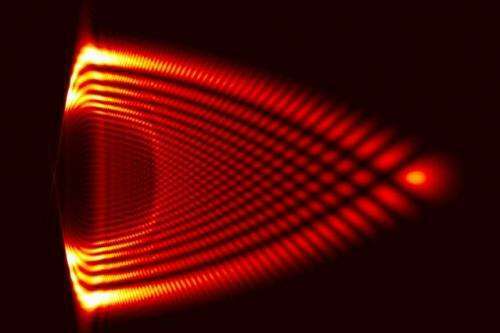 Now, in a new variation on the methods used to bend light, physicists at MIT and Israel's Technion have found that subatomic particles can be induced to speed up all by themselves, almost to the speed of light, without the application of any external forces. The same underlying principle could also be used to extend the lifetime of some unstable isotopes, perhaps opening up new avenues of research in basic particle physics. This manipulation of waves could be accomplished using specially engineered phase masks—similar to those used to create holograms, but at a much smaller scale. Once created, the particles "self-accelerate," the researchers say, in a way that is indistinguishable from how they would behave if propelled by an electromagnetic field. "The electron is gaining speed, getting faster and faster," Kaminer says. "It looks impossible. You don't expect physics to allow this to happen." It turns out that this self-acceleration does not actually violate any physical laws—such as the conservation of momentum—because at the same time the particle is accelerating, it is also spreading out spatially in the opposite direction. "The electron's wave packet is not just accelerating, it's also expanding," Kaminer says, "so there is some part of it that compensates. It's referred to as the tail of the wave packet, and it will go backward, so the total momentum will be conserved. There is another part of the wave packet that is paying the price for the main part's acceleration." It turns out, according to further analysis, that this self-acceleration produces effects that are associated with relativity theory: It is a variation on the dilation of time and contraction of space, effects predicted by Albert Einstein to take place when objects move close to the speed of light. An example of this is Einstein's famous twin paradox, in which a twin who travels at high speed in a rocket ages more slowly than another twin who remains on Earth. In this case, the time dilation could be applied to subatomic particles that naturally decay and have very short lifetimes—causing these particles to last much longer than they ordinarily would. This could make it easier to study such particles by causing them to stay around longer, Kaminer suggests. "Maybe you could measure effects in particle physics that you couldn't do otherwise," he says. In addition, it might induce differences in the behavior of those particles that might reveal new, unexpected aspects of physics. "You could get different properties—not just for electrons, but for other particles as well," Kaminer says. The experiments would make use of an electron microscope fitted with a specially designed phase mask that would produce 1,000 times higher resolution than those used for holography. "It's the most exact way known today to affect the field of the electron," Kaminer says. While this is such early-stage work that it's hard to predict what practical applications it might eventually have, Kaminer says this unusual way of accelerating electrons might prove to have practical uses, such as for medical imaging. "Research on self-accelerating and shape-preserving beams became very active in recent years, with demonstration of different types of optical, plasmonic, and electron beams, and study of their propagation in different media," says Ady Arie, a professor of electrical engineering at Tel Aviv University who was not involved in this research. "The authors derive shape-preserving solutions for the Dirac equation that describe the wave propagation of relativistic particles, which were not taken into account in most of the previous works." Arie adds, "Perhaps the most interesting result is the use of these particles to demonstrate the analog of the famous twin paradox of special relativity: The authors show that time dilation occurs between a self-accelerating particle that propagates along a curved trajectory and its 'twin' particle that remains at rest." An interesting article with immediate implications for wave phenomenon like optics. But its not the "Particles" they are accelerating as the headline describes: I've no doubt that the 'particle' will have the same momentum and velocity as it had before unless a force has acted on it. Only the wave part of the "wave particle duality" has been affected. But this still does have profound consequences for that 'particle'; as you have altered its distribution and therefore its likely position when it de-coheres. They have effectively found a way to move (displace) a 'particle with mass' without ever altering its velocity at all! Its a bit like 'warp drive displacement' but below the speed of light of course. It's just another example of how we are still learning that microscopic technologies can be multi-manipulated to produce identical effects in a magnetic region. Similar light engines do exist but this technology seems more suited for tomographical applications vs propulsion which would be better suited by microwaves to plasmonic drive for control systems that would be handling direct surface plasmons, which are produced from the interaction of most light drive systems. Suppose you had a bunch of electrons travelling at similar velocities into a black box. The black box does stuff so that some big group of electrons are accelerated uniformly... but others are decelerated so that the momentum of the bunch is constant throughout. This work would show that a single particle (a single electron) can self-interfere to produce exactly the same effect. A single electron passing through the same box would most probably be accelerated like the larger bunch previously... but randomly it could also be decelerated. So, the particle *is* affected, but *how* it will be affected is unpredictable. In the article, they note explicitly that the characteristics of single-particle behaviour (like radiation of a single charged particle undergoing acceleration in this environment emitting radiation) is still an open question. Furthermore, they explicitly lay out cases where you can't separate the "wave" part of wave-particle duality. Like the Aharonov-Bomm effect, Two particles of equal momentum, but one prepared in these initial conditions (ie, its 'wave' part being modified) will generate a phase difference during their flight. Similarly, two particles of equal momentum, one so modified, would have different lifetime scales due to the time dilation incurred over this process. Shavera: A single electron passing through the same box would most probably be accelerated like the larger bunch previously... but randomly it could also be decelerated. No single 'particle' could be accelerated (or decelerated) without a force being applied to it:No matter how randomised your bulk thought experiment. What our learned brothers here are expounding about are the stuff of thrusters and warp drives as very possible reality and very soon as the military aspects of this with respect to the old Fermi-Dirac equation...the old bogeyman from fluid dynamics classes in every civil engineering curriculum... Those military exigencies in all great power nations will with mathematical certainty drive an inexorable research. n between 40 and 100 is a good place to start. I like doing color as a product of the axis. I can do all 6 versions and the colors don't criss cross. The fundamental interaction, of opposite charges with equal energy, creates the photon which, at that point, accelerates to c, the speed of light (the characteristic velocity of E-M radiation, not a limit to all velocity). The same interaction transports an electron along a conductor, which provides the opposite charge, albeit at a slower speed (about 2/3 c). A superconductor may allow this velocity to approach c.
Maybe this new way looking on the electron wave structure could help to solve the entire problem …..
"Now, in a new variation on the methods used to bend light, physicists at MIT and Israel's Technion have found that subatomic particles can be induced to speed up all by themselves, almost to the speed of light"
Can someone explain something to me. I was under the understanding that the faster a particle travels the more mass it gains all the way to infinite mass when it reaches light speed. An electron is a particle and has mass so why didn't it grow immensely huge traveling that fast? Evidently I'm misunderstanding something there. Something probably obvious to the rest of you but what please? I think we are seeing the emergence of a new underlying 'force'. This influence is analogous to the Aharonov–Bohm effect and needs only 'potential' and not field to act at a distance. Like Gravity this is a pseudo-force. Also like gravity it does not require charge or field to cause acceleration. Lets call this a 'quantum force' for now and it is able to affect the motion through the 'quantum potential'. The idea that there is trading off of momentum between particles is not true. This is not a new idea see M.V. Berry and N. L. Balazs, "Nonspreading wave packets", Am. J. Phys. 47, 264 (1979). 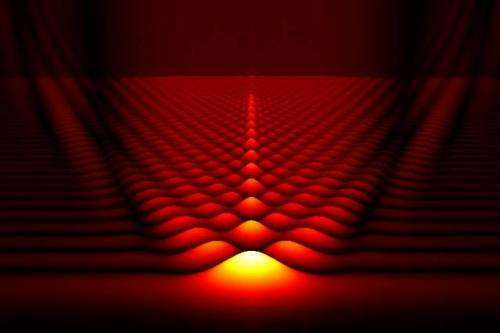 Practical beams of self accelerating photons were created around 2007 see PhysOrg here http://phys.org/n...629.html and been extensively studied. What is known this is a quantum effect, like Young's Experiment, one photon at a time through the double slit experiment make no difference to the pattern... it just builds up. The 'slits' here are a spatial hologram.